From Disney's classic film Beauty & The Beast, this Personalized Beauty & the Beast Book recreates the enchanted tale of love and magic on the page for your loved one. Belle is a village girl from a provincial town with dreams of a better, more exciting life somewhere else. Once her father is captured by a wicked beast, she sacrifices her freedom for his and agrees to be the beast's captive wife. 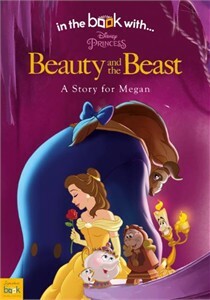 Little does Belle know that the Beast is a handsome prince who has been put under a spell. The curse can be lifted only once he finds true love! This storybook is an enchanted gift for any fan of the original Disney movie. To make it even better, you can customize it with your loved one's name on the header of every page, as well as a personal message to them on the first page. Gift boxes are also available to purchase with this item. Click to preview the inside of this book! Availability: This Personalized Beauty & the Beast Book takes approximately 4-5 business days to leave the warehouse plus transit time.